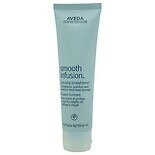 Shop Aveda Smooth Infusion Glossing Straightener (4.2 oz. )4.2 oz. If you have dry hair, opt for a hair straightening shampoo that is developed specifically for this type of hair. 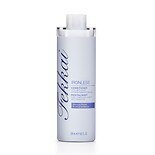 This moisturizing straightening shampoo will leave your hair soft and moisturized, so you are able to experience straight hair without stiffness. When conditioning your hair after using the shampoo, make sure that you continue to use hair straightening product to prevent curling throughout the day. If you have normal hair, make sure the hair straightening shampoo that you purchase does not specify that it is for dry hair. If it does, you will weigh your hair down with too much moisture. Normal straightening shampoo still has its benefits, some of which include strengthening the hair and adding shine. Additionally, some typical shampoos contain vitamins, such as vitamins B3 and B6 to improve the overall health of your hair.